We are a small show breeder/exhibitor in southeast Missouri, about 2 1/2 hrs south of St Louis & 3 hrs east of Springfield. Bulldogs (often referred to as English Bulldogs) are our only breed. We started showing in 1999 and have finished several champions to date. 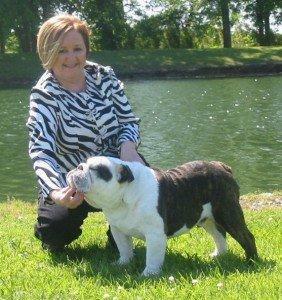 Our greatest accomplishment in the ring is winning BEST IN SPECIALTY SHOW at the 2008 BCA National Specialty with CH Major League’s Show-Me The Babe. BABE beat more than 400 bulldogs from all across the country to win top honors. She is only the 5th female to win Nationals in 100 years. We breed for our next show prospect but bulldogs make wonderful family pets too. We occasionally have puppies for sale to pet or show homes. Our pedigrees are filled with top-name AKC Champion show dogs. We are members of the Bulldog Club of America (BCA). And are HALL OF FAME breeders. We also provide Champion stud service to approved females.